A root vegetable similar in appearance to beets. Turnips are considered to have a strong flavor which can be undesirable in certain dishes if some of the flavor isn't allowed to escape during cooking. Turnips provide a good source of fiber and vitamin C, and are naturally low in calories. Both the greens as well as the root are edible. 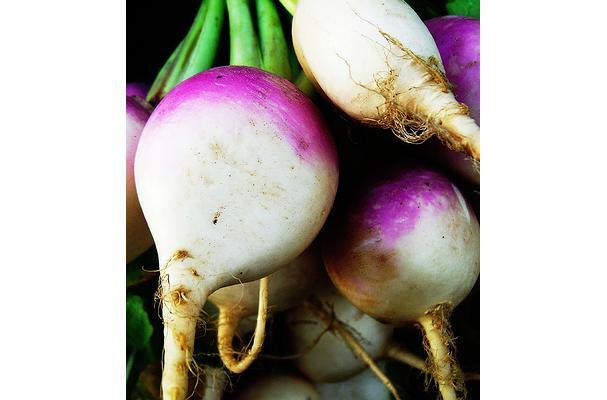 Most common type of turnip is mostly white skinned apart from the upper 1-6 centimeters, which protrude above the ground and are purple, red, or greenish wherever sunlight has fallen. Entire root is roughly conical, but can be occasionally tomato-shaped about 5-20 centimeters in diameter and lacks side roots. Choosing: Choose turnips that are firm, heavy and have unblemished skin. You can peel them with a potato peeler, then cut into small chunks, but just cleaning and slicing without peeling is fine too as the entire vegetable is edible. Store turnips in a cool, dry, place. History: Turnip was a well-established crop in Hellenistic and Roman times, which leads to the assumption that it was brought into cultivation earlier. Wild forms of hot turnip and its relatives the mustards and radish are found ever west Asia and Europe, suggesting that their domestication took place somewhere in that area. The Turnip (Brassica rapa L.) is a root Brassica crop and has been used as a vegetable for human consumption in Europe since prehistoric times. Turnip root has been a popular livestock fodder for at least 600 years wherever the crop can be grown. For most of that time turnip roots have been managed as forage. Researchers in the United States determined in the early 1900s that turnip roots are valuable energy sources for young ruminant animals. However, livestock farmers at that time were turning away from the Brassica root crops (which also include rutabagas or swedes) for fodder because much hand labor was required for the production and utilization of the large roots. One study showed that the labor requirement on a nutrient basis for these crops was three times that needed for corn silage production.